Fixed the issue where the Upgrade Successful notification does not display for non-admin users. Thanks to a tip from Carl (see comments) I used a somewhat ancient mechanism called ActiveSetup that is still available in Windows 10. These changes have added a couple more scripts to the download, but the task sequence remains unchanged, so simply update your notifications package in ConfigMgr. 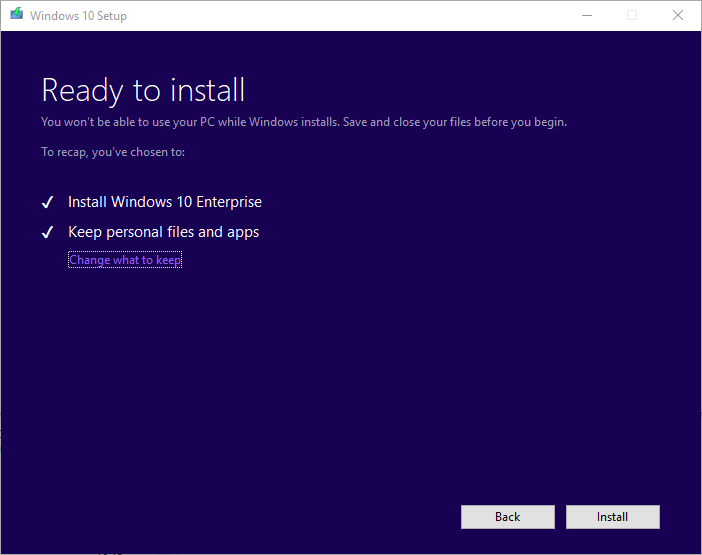 When upgrading to Windows 10 from a ‘down-level’ OS, or to a new version of Windows 10, using installation media, you get a nice UI that guides you through the installation process. 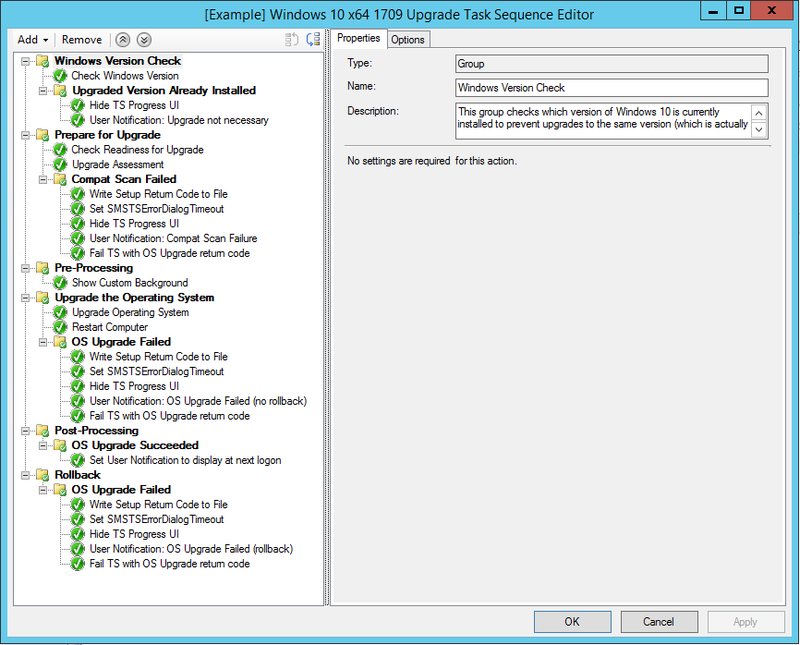 Upgrading using an OS upgrade task sequence in ConfigMgr however, is a comparatively cold experience with no UI except for the TS Progress UI – assuming you enable that. For an IT admin of course, we don’t necessarily care about having a nice UI, we just care that it works and we have log files to check if it doesn’t. But for an end user that can be a different story. It may be a little disconcerting to some that their system is being upgraded yet the upgrade process is providing little feedback about what is happening. Once you get past the online phase of the upgrade however, the experience is more streamlined. 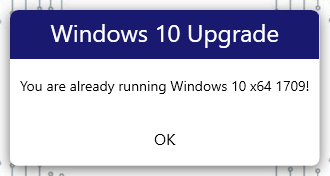 In an OS upgrade task sequence, Windows Setup will be running silently in SYSTEM context so it will not display anything to the logged-on user. Everything is handled by the task sequence. If the task sequence fails, the user might feel panicked and wonder if they have lost any of their data or applications. There is nothing to reassure them otherwise. We may not be able to reproduce the nice Windows Installer UX, but we could at least add a few custom notifications at different points in the TS to provide some feedback to the end user and improve the overall experience from their perspective. I experimented with this a bit using my New-WPFMessageBox PowerShell function and the following is what I came up with. 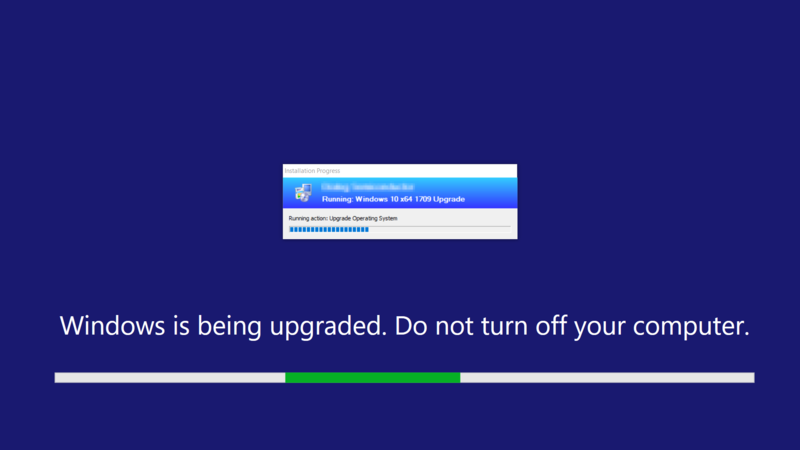 At the start of the upgrade task sequence, I like to check the currently-installed Windows version because – strange but true – the Windows Setup process will not prevent you from ‘upgrading’ to a version you are already running! How’s that for a time-waster?! Of course, you would try to avoid that with correct collection targeting in ConfigMgr, but just as an insurance I check that the system is not already running that version, and if it is, display the following notification to the user, then exit the TS. Next, during the online phase of the Upgrade Operating System step, I display a custom background. This is just to discourage the user from working or rebooting the computer and provides some extra assurance that something is actually happening. This is actually a WPF window that fills the screen, not a desktop wallpaper. 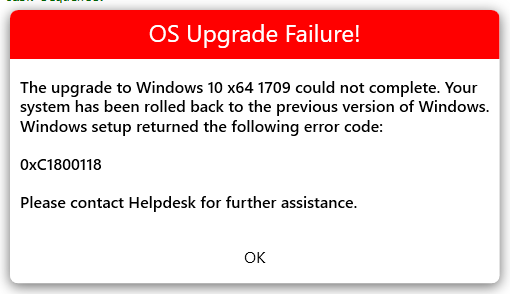 The same if the upgrade fails, or if a rollback is performed, although no descriptions here as there are many possible result codes. Using my New-WPFMessageBox function you can customise these notifications as you please. I’ve also made available all the PowerShell scripts I used as a download. Simply create a standard package in ConfigMgr containing the all the scripts in the same directory and distribute the content (no program required). 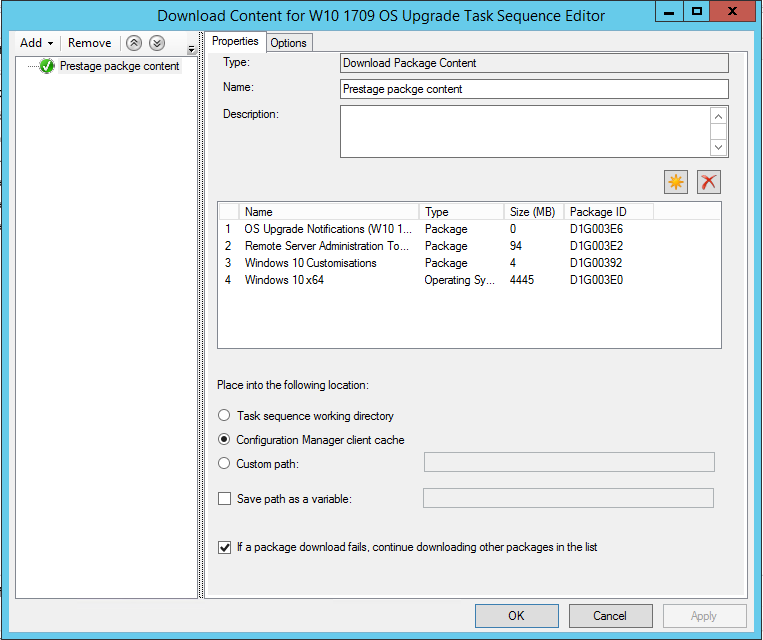 Update the imported task sequence to reference this package for each of the Run PowerShell script steps, and also reference your OS Upgrade package in the relevant steps. The notifications display in the context and session of the logged-on user. This is accomplished by calling the notification scripts via another script – Invoke-PSScriptAsUser.ps1 – that creates a PowerShell process in the user’s context. Where a notification is displayed, I also first hide the TS Progress UI using the TSDisableProgressUI variable, which is available since ConfigMgr Current Branch 1706. This is because the notification will display behind the TS Progress UI, although if there are no further steps to complete after the notification is displayed it doesn’t matter too much because the TS Progress UI will not display for long anyway. The task sequence will not wait for the user to respond to the notification before it continues processing any remaining steps. 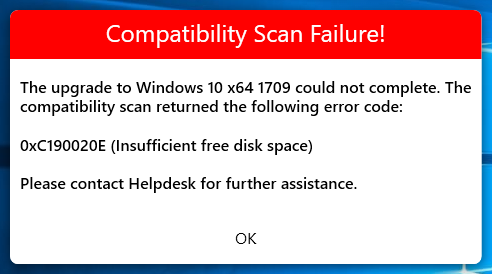 Where the compatibility scan or OS upgrade fails, the step is set to continue on error so that we can handle the error ourselves. After displaying the error notification, we manually fail the TS using the _SMSTSOSUpgradeActionReturnCode TS variable value as the error code. Where the compatibility scan or OS upgrade fails, we write out the return code to a file so that the custom notification, which runs in the user context, can read in the value. This is because the task sequence variables are only available to query in the SYSTEM context – the user context cannot read them. In handling a failure I set the SMSTSErrorDialogTimeout TS variable to 1 second so that the TS fails quickly and the user is left with our custom error notification instead of the default TS one. The final notification that the upgrade was successful displays for the first user that logs in after the TS has completed. 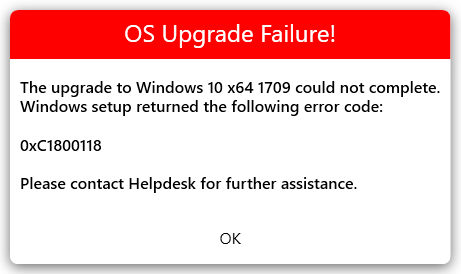 This is because the OS Upgrade TS simply ends at the Windows lock screen where we cannot display anything. Before the TS ends, we copy the notification script to a temp location and set the RunOnce registry key to call it. Pay attention to the step conditions for the groups in the task sequence, as this controls the logical flow of the sequence. Another important activity that should be done before making an OS Upgrade task sequence available is to pre-cache as much content as possible on the target systems. Unless the content is already in the ConfigMgr client cache when the TS runs, it’s gonna need to download that content which, for an OS Upgrade TS, is a sizeable amount of data and could add significant time to the execution of the task sequence making for a poorer experience for the end user. Since ConfigMgr 1702, we have had the ability to pre-download content for a task sequence, and this was improved a bit in 1706, but in my own experience I have not found it to do quite what it says on the tin. Specifically, this line in the documentation – When the client receives the deployment policy, it will start to pre-cache the content. – appears not to be true (at the time of writing with 1706). Even when you have correctly set the OS Architecture and language on the OS Upgrade package, and set the required conditions on the Upgrade Operating System step, no content is actually cached on the client until the date the deployment becomes available. That is, you can target a system with a deployment that has an available date in the future, and theoretically it should start caching content as soon as a machine policy refresh occurs. But in practice, it does not cache any content until the available date of the deployment is reached, then shortly after it will start to download the content. If the user decides to upgrade as soon as the deployment becomes available, they will need to wait for the content to download first. If anyone has a different experience with this, please let me know! Until that is fixed, we can still pre-cache most of the content by creating a hidden task sequence that uses the Download Package Content step. Make sure to use the Configuration Manager client cache as the location. Check the option to Suppress task sequence notifications on the TS properties, and deploy the TS to the target systems before you deploy the OS Upgrade TS. Download the PowerShell Scripts and exported Task Sequence here.